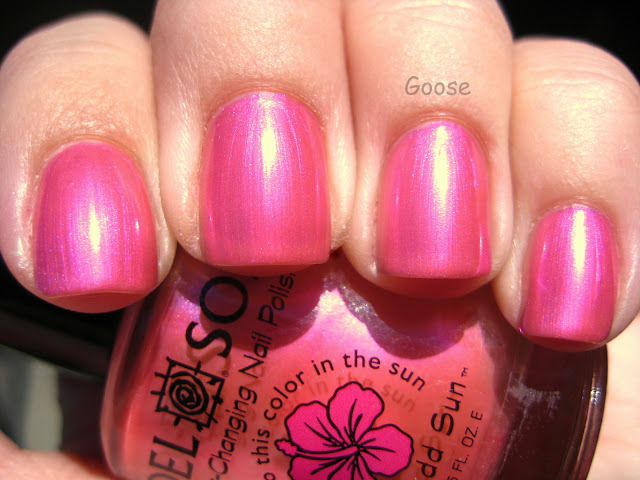 Let me start by saying that I'm a BIG fan of Del Sol polishes, and it's probably because there is SO much sun in Arizona. Since many of the polishes change to a pink, red, or maroon in the sun, they make great Valentine's Day colors. The first one up is Heartbreaker. It's a pretty red glitter indoors - more cool, berry-toned than China Glaze Ruby Pumps (which I actually do not own... can you believe it?! Probably 500+ polishes and I don't even have this cult favorite). 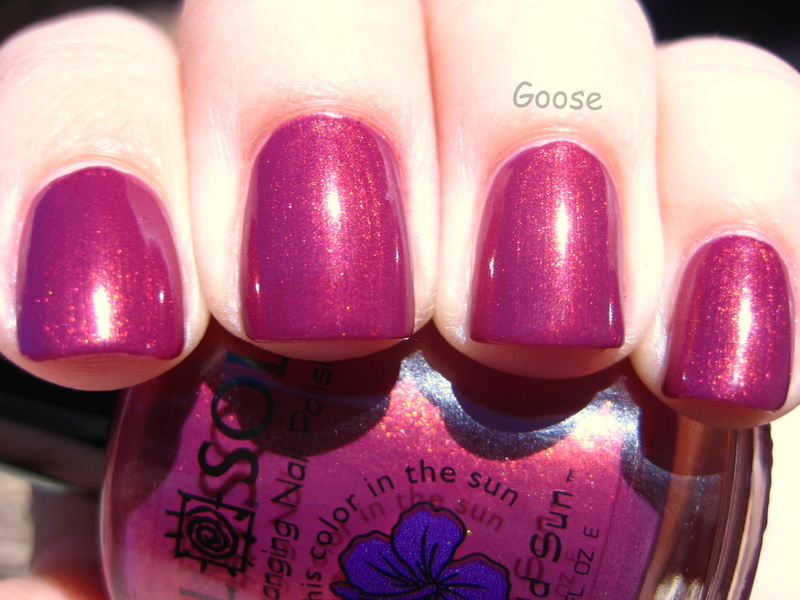 In the sun, the color really deepens to a dark berry maroon or burgundy. I would almost call it a dark red grape, but it's not QUITE that purple. Either way it's stunning! The next one is called Girls Night Out. 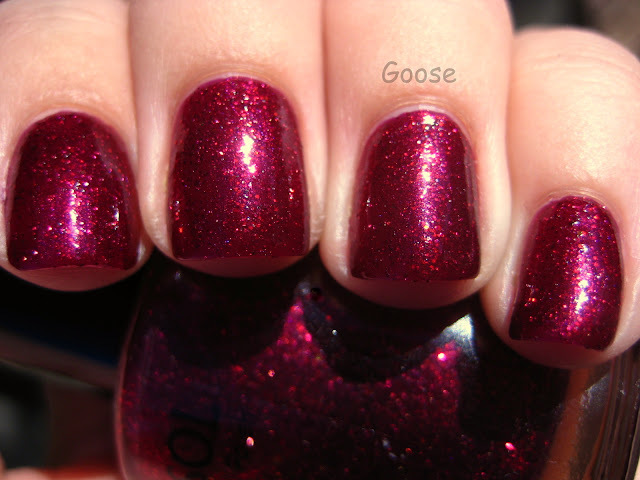 It starts out as a rosy bright pink with gold shimmer. In the sun it gets very purple, but keeps the gold shimmer. Next is Pretty in Pink. Indoors it's a white base with HEAVY pink flash. The pink flash really dominates this one, and makes it appear like a pearly cool-toned baby pink. This is three coats, and there is still VNL, but I don't really mind it. Outside it all turns to a soft mid-toned pink. VERY girly! 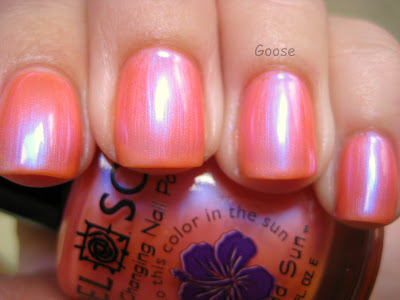 Last but not least, is Secret Crush. 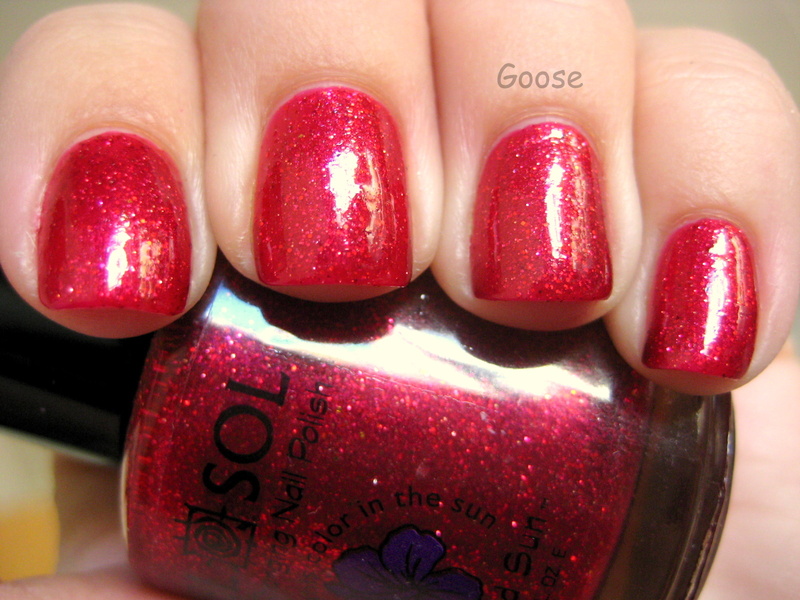 It's not really a traditional Valentine's Day polish, but it's my favorite Del Sol polish, so I had to include it. It's such a pretty soft orange coral with a strong blue pearl to it (yes, up close and in the pictures you can see brushstrokes, but I assure you they are not at all noticeable in person - doing three thin coats instead of two thick coats keeps the brushstrokes at bay). Then outside... WOW. It changes to a dusty purple base with that same electric blue pearl, and it's absolutely amazing. I love how much the color changes in this one, and I just adore both "versions" (inside and outside). I've heard rumors of "bottles that didn't change color much." I think that this is actually due to the sun available, not the formulation itself. In Arizona, these are wonderful - they change almost instantly and very drastically. However, if you live in a place that's mostly cloudy, you may see little to no change whatsoever. Another thing to note is that if you use any sort of sunscreen (even putting moisturizer with SPF 15 in it on your face using your fingers), there will be NO color change at all. The polishes rely on the UV rays from the sun to change the color, so be sure to try them on days with a high UV index for maximum change. Also, what do you think of the new larger picture size? Thanks for these awesome pictures! 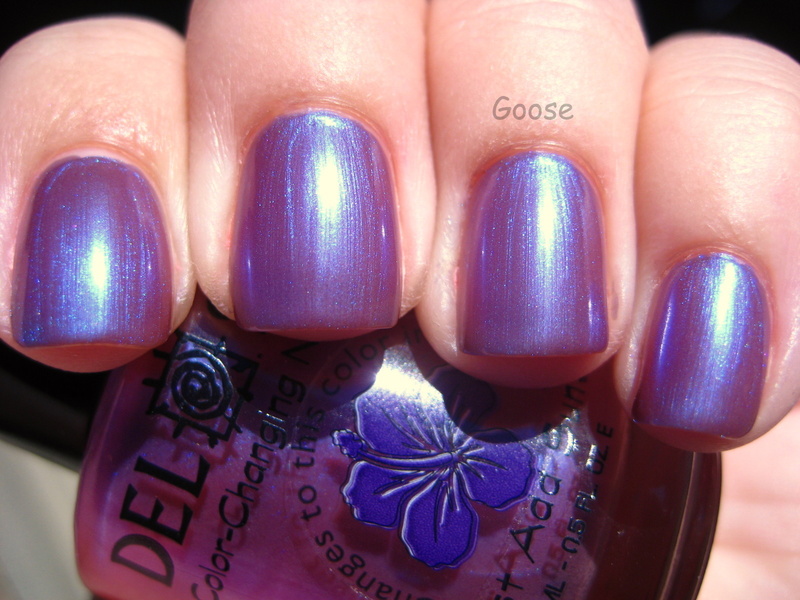 I love seeing Del Sol swatches, the color change process fascinates me. I only wish they were sold in my area! that polish is really interesting and i've yet to own one. sad, it's not available here. i love mood polish from claire's and i would love to have that too. i like heartbreaker and girls night out. it's really cute! I LOVE these polishes. I picked one up in a questionable Walgreens in Las Vegas. And I will say, the color change in Las Vegas compared to back home in Michigan was noticeable. Much better color in LV. Heartbreaker looks tunning! !And love your shape nails!! I just wanted to let you know that I find it really aweful how you got jumped when expressing your feelings. The ones biting back says you get to have freedom and the right to your own personal opinion and yet that doesn't apply when you say things you don't like about America. I don't live there but I get the same news reports as everybody else. We have the right, in a democracy (some ppl do question how democratic certain selections are) to speak our mind - wheather it's bad or good. But as far as I'm concerned, the tantrum that was thrown afterwards was NOT democratic but more of a bullying nature. I for example do like to live in Sweden but there are a lot of things I do not like about Sweden. For example how the government in the last couple of years have started to care only about healthy ppl with no issues, and only if you work. I don't fall in the category of having no home, or no food, or something like that but there are ppl who live on the street and in the winter it gets really cold! What I'm trying to say is that I think you have the right to think and say anything you'd like - freedom of speach. I find it sad that some don't seem to honour that when talking about freedom. Did they forget? Look at my blog, will be an honor to have her as a follower! !